Click here to see how you can get a mixed doubles program at your curling facility! 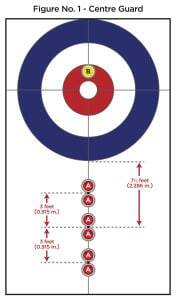 View “An Introduction to Mixed Doubles Curling” HERE (courtesy of the World Curling Federation). The new Olympic sport of mixed doubles curling is growing in popularity across the curling world especially with the recent announcement of inclusion for the 2018 Winter Games in Korea. The game can be played at a high level in competition or in the newly forming mixed doubles spiels and club leagues. It is fun to play, only requires two players per team and can be played in an hour! Officially, a team is composed of two players, one male and one female. However, curling leagues wanting to fill ice time, can make it open to both or either gender. Curling rinks can also organize a stick league for mixed doubles. At the competitive level, each game is scheduled for eight (8) ends but that can shortened for a club experience of 5-6 ends (which takes less than 1 hour to play). The scoring is the same as in a regular game of curling. 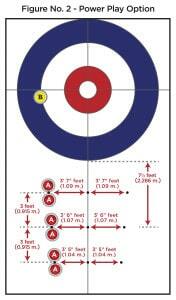 The major difference between regular curling and mixed doubles curling is the positioning of two stones – one per team – that are set before the beginning of each end. These “positioned” stones that are placed before the beginning of each end are also eligible to be counted in the scoring. In a new term, the team with the ‘hammer’ or last stone advantage now has the option. That option is which stones to position where. Teams can decide to put their stone in the back four foot and the other team’s stone as the centre guard. If you choose this option, the opposition would deliver first in the end. If you choose to put your stone as the guard, then you would deliver first. Here is the positioning (figure no. 1). There are three positions for the centre guard depending on the amount of curl in the ice. The more curl, the closer to house you would position the guard. See rules document below for a larger copy of this diagram. The in-house stone, which belongs to the team with last stone in that end, is placed with the back edge of the stone abutting the front edge the tee line, with half the stone in the 8-foot and half in the 12-foot circle. The guard stone is positioned to the side of the sheet, so it would be bisected by a direct line between the middle of the in-house stone to the middle of the hack. The distance of this corner guard from the house will be the same distance that was determined for the centre guards. Modified Free Guard Zone – No stone in play, including the “positioned” stones and those in the house, can be moved to an out-of-play position prior to the delivery of the fourth stone of an end (the fourth delivered stone is the first stone that can remove any stone from play). If there is a violation, the delivered stone shall be removed from play, and any displaced stone(s) shall be replaced to their original position by the non-offending team. A team is composed of two players, one male, and one female. Alternate players are not allowed. A team must forfeit any game(s) in which it fails to have both players playing for the entire game. Modified Free Guard Zone: no stone in play, including the “positioned” stones and those in the house, can be moved to an out-of-play position prior to the delivery of the fourth stone of an end. If there is a violation, without exception, the delivered stone shall be removed from play, and any displaced stone(s) shall be replaced to their original position by the non-offending team. 915 m. (3 feet) from the mid-point (i) closer to the hog line. Power Play Option: Once per game, each team, when they have the decision on the placement of the “positioned” stones, can use the “Power Play” option to position the stones. The in-house stone, which belongs to the team with last stone in that end, is placed with the back edge of the stone abutting the front edge of the tee line, with half the stone in the 8-foot and half in the 12-foot circle. The guard stone is positioned to the side of the sheet, so it would be bisected by a direct line between the middle of the in-house stone to the middle of the hack where the hack intersects with the centre line. The distance of this corner guard from the house will be the same distance that was determined for the centre guards and is either immediately in front of or immediately behind one of three (3) points in the ice. The corner guard can be placed on either side of the ‘spot’ (closer to the house or closer to the hog line) determined prior to the game. The “Power Play” option cannot be used in extra ends. Teams will toss a coin for the decision in the first end. The team whose “positioned” stone is placed in Position A in both Figure No. 1 & No. 2 shall deliver the first stone in that end. While a team is in the process of delivery, that team’s non-delivering player may be anywhere on the ice surface. After delivery, either or both players may sweep their delivered stone and any stones set in motion belonging to their team anywhere in front of the tee line at the playing This applies to all the teams delivered stones. If a player delivers a stone out of proper rotation, the delivered stone is removed from play and any displaced stones are returned to their original positions by the non- offending team. Should the infraction not be discovered until after the delivery of a subsequent stone, play continues as if the infraction had not occurred; however, the player that delivered the first stone of the end can deliver a maximum of two stones in that end.